Now that Spring is finally here, I am focusing on enhancing my color-rich wardrobe and excited to see that many of my picks happen to be included in the Saks Fifth Avenue Family & Friends Sale (savings up to 25% off through Sunday, April 7th)! Below are some of my favorite pieces that will complement the bright colors during this amazing time of year, all inspired by the California Super Bloom! I love wearing more color for spring and my newest obsession is this beautiful pleated, midi-length skirt by A.L.C, which I paired two ways - with an oversized comfy sweater and casual white tank top. I also like wearing these types of skirts (and dresses) with mules, slides, wedges or even a pair of fun sneakers. This skirt looks gorgeous amongst the magnificent orange color of the poppies and green grasslands. Plus the crisp pleats bring swingy movement with the lavender and clementine tones for a soft, artful look. shop my Super Bloom look directly by clicking on the items in the carousel! It’s been an unusually wet and cooler winter here in LA BUT this has brought spring flowers in abundance! During this short period of time I was lucky enough to go visit Lake Elsinore, California to see the bright blooms blanket the area in a rare sighting known as a “Super Bloom.” So rare that satellites can see this spectacular explosion of wildflowers from space! Plus the Super Bloom has also caused millions of migrating painted lady butterflies to fill the sky in Southern California! If you live in or visiting California throughout April take this chance to see this beautiful display of mother nature. Be careful and stick to official trails. The California Department of Parks and Recreation strongly advises visitors to the Antelope Valley California Poppy Preserve to avoid walking among and trampling the delicate flowers. For more informatation on the best locations for viewing spring wildflowers in Southern and Central California visit The Theodore Payne Foundation website. Here‘s the same ALC skirt dressed down and worn with a casual white tank. You can pair this with a cute pair of sneakers and unconstructed bag to complete the look. This entire look is available at Saks, so take advantage of the 25% off Saks Family and Friends SALE and shop my fave Spring picks now! Sale until April 7 2019. Shop the carousel by clicking directly on the image! 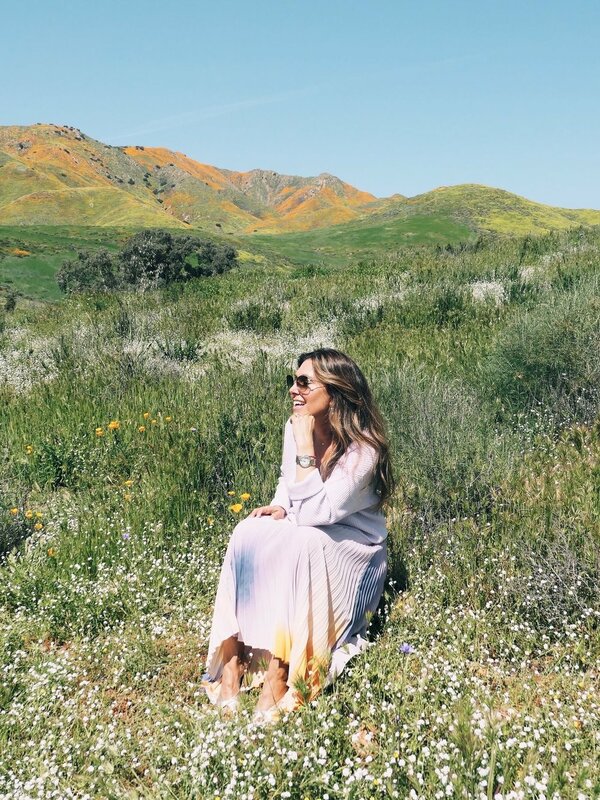 Enjoying the Super Bloom with by blogging photographer hubby Michael Meyers! Poppies open up in mid morning, and curl up in the late afternoon/evening or if it’s cold, so check the weather forecast before arriving. I hope you get the chance to see and enjoy the fantastic Super Bloom this Spring!